In this Unreal Engine 4 tutorial, you will learn how to create C++ classes and expose variables and functions to the editor. Blueprints is a very popular way to create gameplay in Unreal Engine 4. However, if you’re a long-time programmer and prefer sticking to code, C++ is for you! 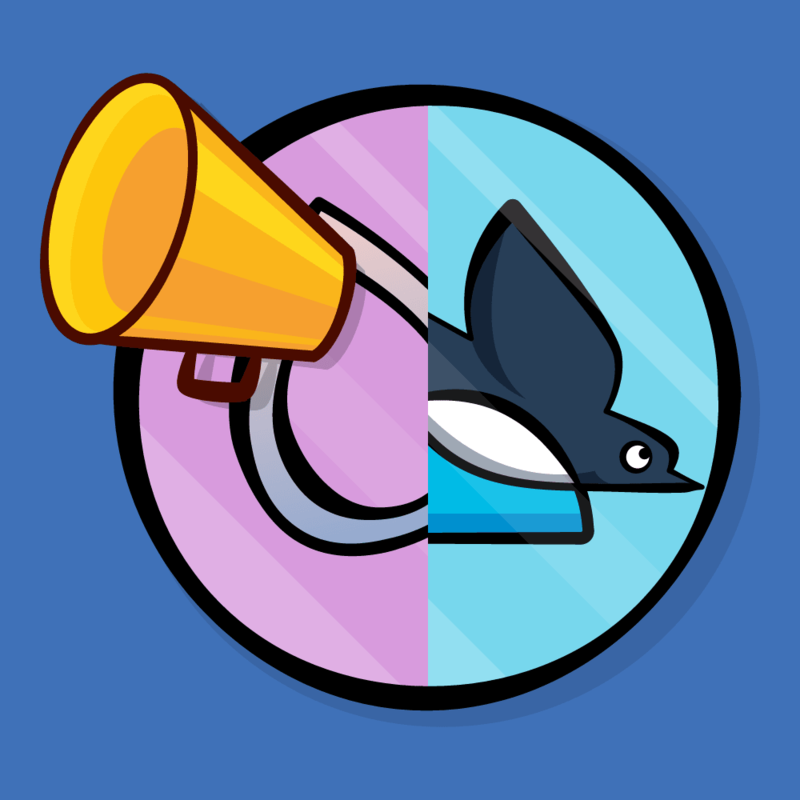 Using C++, you can also make changes to the engine and also make your own plugins. Please note that this is not a tutorial on learning C++. 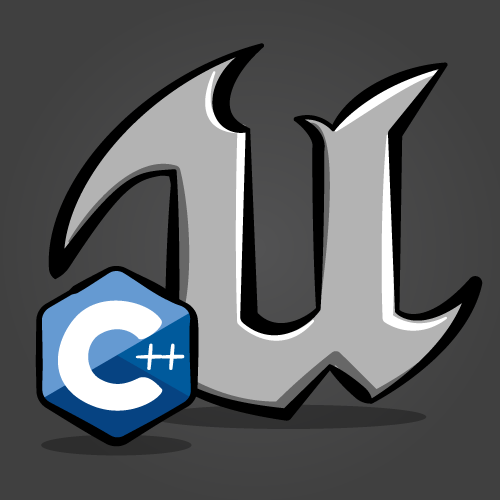 Instead, this tutorial will focus on working with C++ in the context of Unreal Engine. Note: This tutorial assumes you already know the basics of using Unreal Engine. If you are new to Unreal Engine, you should go through our 10-part Unreal Engine for Beginners tutorial series first. Afterwards, download the starter project and unzip it. Navigate to the project folder and open CoinCollector.uproject. 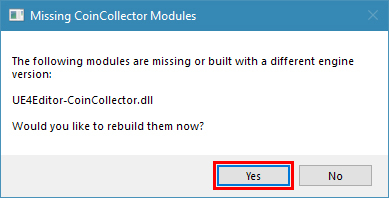 If it asks you to rebuild modules, click Yes. 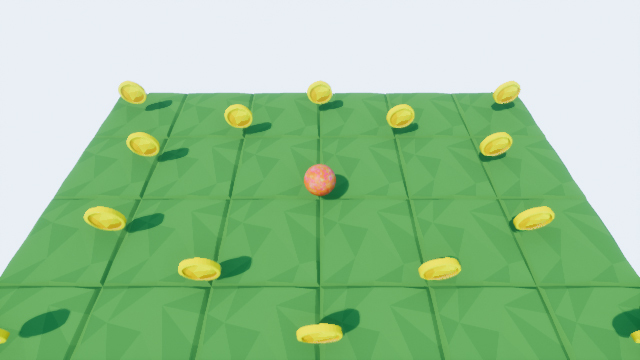 In this tutorial, you will create a ball that the player will control to collect coins. In previous tutorials, you have been creating player-controlled characters using Blueprints. For this tutorial, you will create one using C++. To create a C++ class, go to the Content Browser and select Add New\New C++ Class. This will bring up the C++ Class Wizard. First, you need to select which class to inherit from. Since the class needs to be player-controlled, you will need a Pawn. Select Pawn and click Next. In the next screen, you can specify the name and path for your .h and .cpp files. 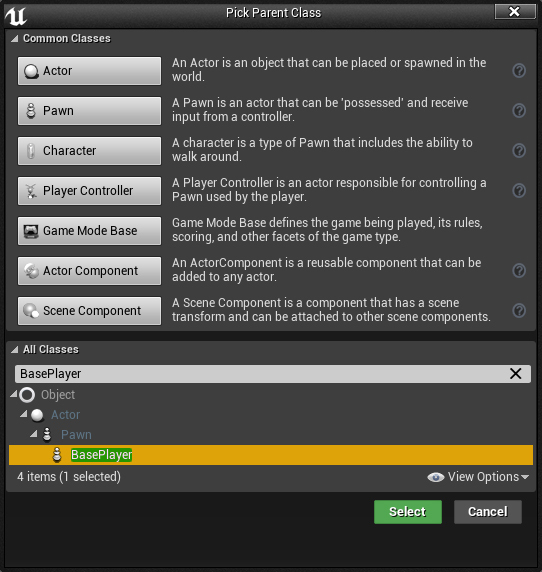 Change Name to BasePlayer and then click Create Class. This will create your files and then compile your project. After compiling, Unreal will open Visual Studio. 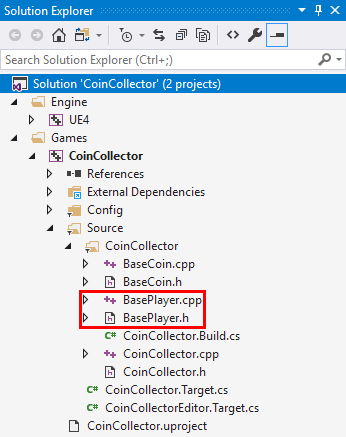 If BasePlayer.cpp and BasePlayer.h are not open, go to the Solution Explorer and open them. You can find them under Games\CoinCollector\Source\CoinCollector. Unreal requires these lines in order for a class to be visible to the reflection system. If this sounds confusing, don’t worry. Just know that the reflection system will allow you to do things such as expose functions and variables to Blueprints and the editor. You’ll also notice that your class is named ABasePlayer instead of BasePlayer. 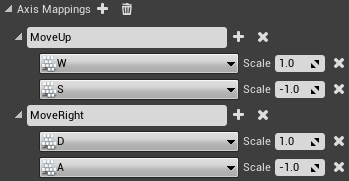 When creating an actor-type class, Unreal will prefix the class name with A (for actor). The reflection system requires classes to have the appropriate prefixes in order to work. You can read about the other prefixes in Epic’s Coding Standard. Note: Prefixes will not display within the editor. 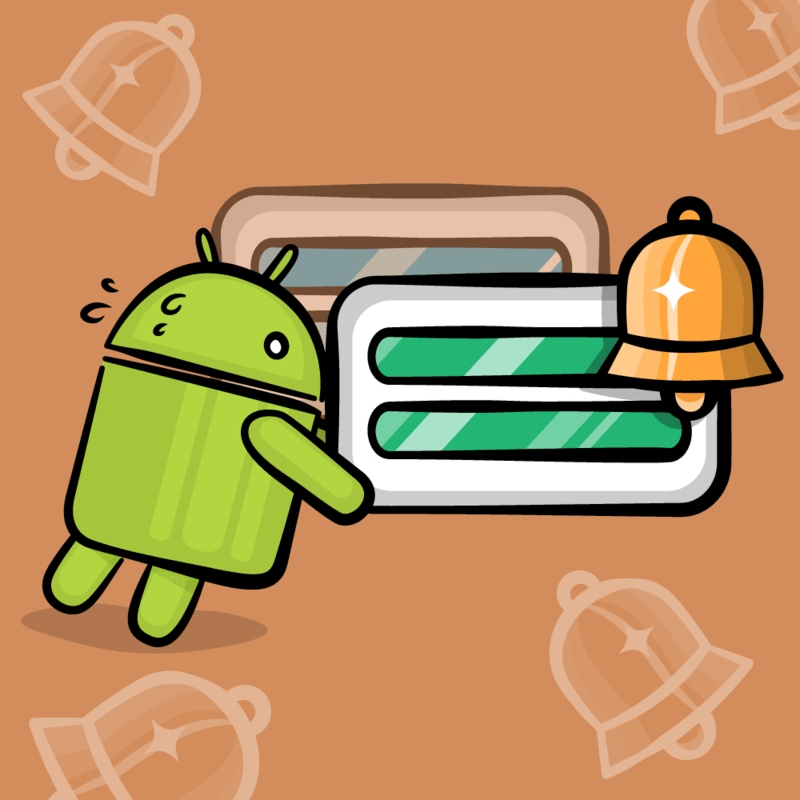 For example, if you wanted to create a variable of type ABasePlayer, you would search for BasePlayer. That’s all you need to know about the reflection system for now. Next, you will add a player model and camera. To do this, you need to use components. Spring Arm: This component operates like a camera boom. One end will be attached to the mesh and the camera will be attached to the other end. If it is not the last include, you will get an error when compiling. The name you use here will be the name of the component in the editor. In this case, the components will display as Mesh, SpringArm and Camera. You can also add specifiers to UPROPERTY(). These will control how the variable behaves with various aspects of the engine. Add VisibleAnywhere and BlueprintReadOnly inside the brackets for each UPROPERTY(). Separate each specifier with a comma. VisibleAnywhere will allow each component to be visible within the editor (including Blueprints). BlueprintReadOnly will allow you to get a reference to the component using Blueprint nodes. However, it will not allow you to set the component. It is important for components to be read-only because their variables are pointers. You do not want to allow users to set this otherwise they could point to a random location in memory. Note that BlueprintReadOnly will still allow you to set variables inside of the component, which is the desired behavior. Note: For non-pointer variables (int, float, boolean etc. ), use EditAnywhere and BlueprintReadWrite instead. Now that you have variables for each component, you need to initialize them. To do this, you must create them within the constructor. This will create a component of each type. It will then assign their memory address to the provided variable. The string argument will be the component’s internal name used by the engine (not the display name although they are the same in this case). The first line will make Mesh the root component. The second line will attach SpringArm to Mesh. Finally, the third line will attach Camera to SpringArm. However, in Blueprints, you can just select a mesh from a drop-down list. If you were to move the asset to another folder, your Blueprints wouldn’t break. However, in C++, you would have to change every reference to that asset. To set the mesh and spring arm rotation within Blueprints, you will need to create a Blueprint based on BasePlayer. Note: It is common practice to create base classes in C++ and then create a Blueprint subclass. This makes it easier for roles such as artists and designers to edit classes. In Unreal Engine, navigate to the Blueprints folder and create a Blueprint Class. Expand the All Classes section and search for BasePlayer. Select BasePlayer and then click Select. Rename it to BP_Player and then open it. First, you will set the mesh. 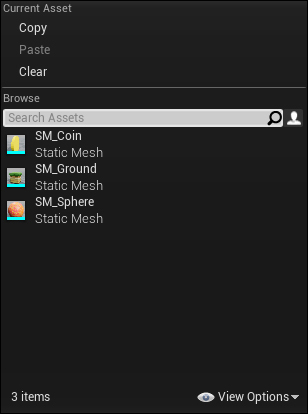 Select the Mesh component and set its Static Mesh to SM_Sphere. Next, you need to set the spring arm’s rotation and length. This will be a top-down game so the camera needs to be above the player. Select the SpringArm component and set Rotation to (0, -50, 0). This will rotate the spring arm so that the camera points down towards the mesh. Since the spring arm is a child of the mesh, it will start spinning when the ball starts spinning. To fix this, you need to set the rotation of the spring arm to be absolute. Click the arrow next to Rotation and select World. Afterwards, set Target Arm Length to 1000. This will place the camera 1000 units away from the mesh. 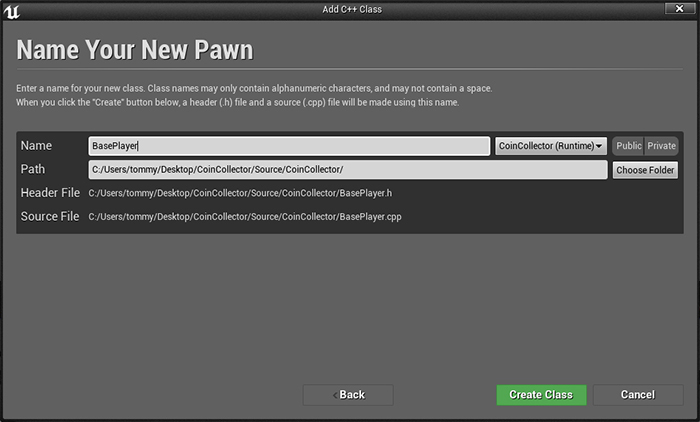 Next, you need to set the Default Pawn Class in order to use your Pawn. Click Compile and then go back to the editor. 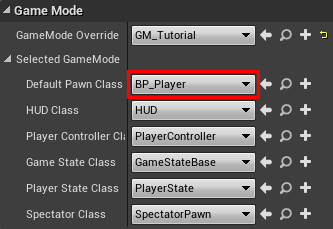 Open the World Settings and set Default Pawn to BP_Player. Press Play to see your Pawn in the game. 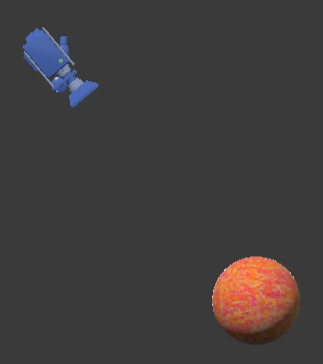 The next step is to add functions so the player can move around. Instead of adding an offset to move around, you will move around using physics! First, you need a variable to indicate how much force to apply to the ball. EditAnywhere allows you to edit MovementForce in the Details panel. BlueprintReadWrite will allow you to set and read MovementForce using Blueprint nodes. Next, you will create two functions. One for moving up and down and another for moving left and right. Later on, you will bind axis mapppings to these functions. By doing this, axis mappings will be able to pass in their scale (which is why the functions need the float Value parameter). Note: If you are not familiar with axis mappings and scale, check out our Blueprints tutorial. 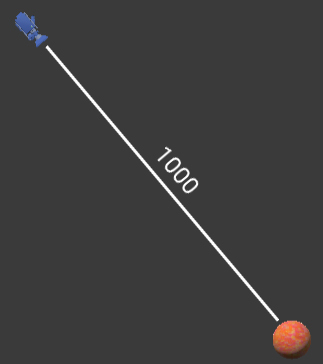 MoveUp() will add a physics force on the X-axis to Mesh. The strength of the force is provided by MovementForce. By multiplying the result by Value (the axis mapping scale), the mesh can move in either the positive or negative directions. MoveRight() does the same as MoveUp() but on the Y-axis. Now that the movement functions are complete, you need to bind the axis mappings to them. For the sake of simplicity, I have already created the axis mappings for you. You can find them in the Project Settings under Input. Note: Axis mappings do not need to have the same name as the function you are binding them to. This will bind the MoveUp and MoveRight axis mappings to MoveUp() and MoveRight(). That’s it for the movement functions. 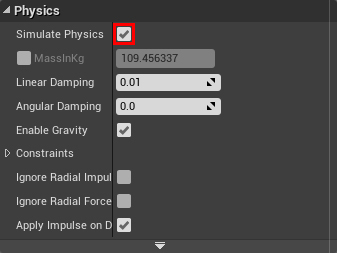 Next, you need to enable physics on the Mesh component. The first line will allow physics forces to affect Mesh. The second line will set MovementForce to 100,000. This means 100,000 units of force will be added to the ball when moving. By default, physics objects weigh about 110 kilograms so you need a lot of force to move them! If you’ve created a subclass, some properties won’t change even if you’ve changed it within the base class. In this case, BP_Player won’t have Simulate Physics enabled. 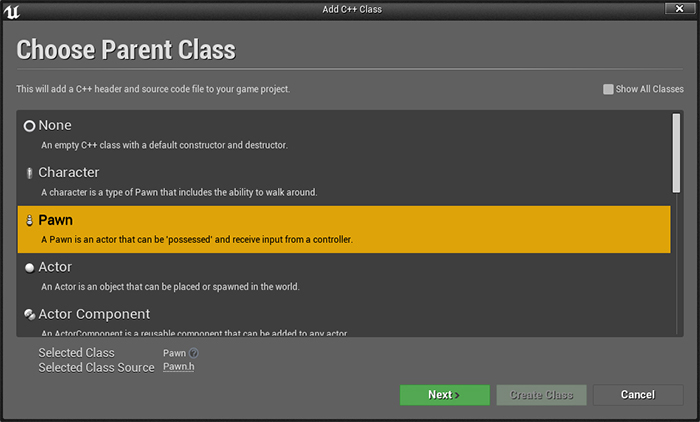 However, any subclasses you create now will have it enabled by default. Compile and then go back to Unreal Engine. Open BP_Player and select the Mesh component. Afterwards, enable Simulate Physics. Click Compile and then press Play. Use W, A, S and D to move around. Next, you will declare a C++ function that you can implement using Blueprints. This allows designers to create functionality without having to use C++. To learn this, you will create a jump function. First you need to bind the jump mapping to a function. In this tutorial, jump is set to space bar. First is a float variable called JumpImpulse. You will use this when implementing the jump. It uses EditAnywhere to make it editable within the editor. It also uses BlueprintReadWrite so you can read and write it using Blueprint nodes. Next is the jump function. UFUNCTION() will make Jump() visible to the reflection system. BlueprintImplementableEvent will allow Blueprints to implement Jump(). If there is no implementation, any calls to Jump() will do nothing. Note: If you want to provide a default implementation in C++, use BlueprintNativeEvent instead. You’ll learn how to do this later on in the tutorial. This will bind the Jump mapping to Jump(). It will only execute when you press the jump key. If you want it to execute when the key is released, use IE_Released instead. Up next is overriding Jump() in Blueprints. Compile and then close BasePlayer.cpp. Afterwards, go back to Unreal Engine and open BP_Player. Go to the My Blueprints panel and hover over Functions to display the Override drop-down. Click it and select Jump. This will create an Event Jump. Note: An override will be an event if there is no return type. If there is a return type, it will be a function. 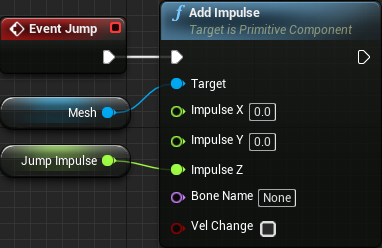 This will add an impulse (JumpImpulse) on the Z-axis to Mesh. Note that in this implementation, the player can jump indefinitely. Next, you need to set the value of JumpImpulse. Click Class Defaults in the Toolbar and then go to the Details panel. Set JumpImpulse to 100000. Click Compile and then close BP_Player. Press Play and jump around using space bar. 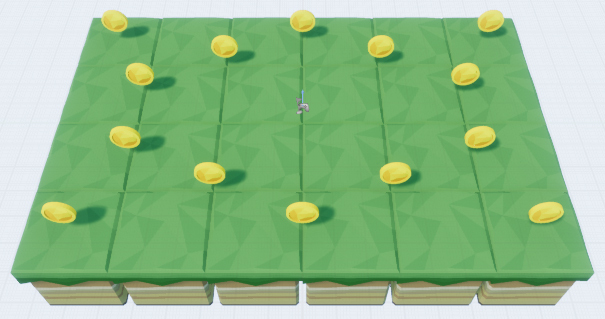 In the next section, you will make the coins disappear when the player touches them. After binding, OnOverlap() will execute when the coin overlaps another actor. OverlappedActor will be the coin and OtherActor will be the other actor. Next, you need to implement OnOverlap(). If the cast is successful, it will return a pointer to ObjectToCast. If unsuccessful, it will return nullptr. By checking if the result is nullptr, you can determine if the object was of the correct type. Now, when OnOverlap() executes, it will check if OtherActor is of type ABasePlayer. If it is, destroy the coin. Next, you need to bind OnOverlap(). This will bind OnOverlap() to the OnActorBeginOverlap event. This event occurs whenever this actor overlaps another actor. Compile and then go back to Unreal Engine. Press Play and start collecting coins. When you overlap a coin, the coin will destroy itself, causing it to disappear. Note: If the coins don’t disappear, try restarting the editor to do a full recompile. Some code changes require a restart in order to work. In the next section, you will create another overridable C++ function. However, this time you will also create a default implementation. To demonstrate this, you will use OnOverlap(). Now, if a child Blueprint does not implement OnOverlap(), this implementation will be used instead. The next step is to implement OnOverlap() in BP_Coin. For the Blueprint implementation, you will call PlayCustomDeath(). This C++ function will increase the coin’s rotation rate. After 0.5 seconds, the coin will destroy itself. Now whenever a player overlaps a coin, Play Custom Death will execute. Click Compile and then close BP_Coin. Press Play and collect some coins to test the new implementation. As you can see, working with C++ in Unreal Engine is quite easy. Although you’ve accomplished a lot so far with C++, there is still a lot to learn! I’d recommend checking out Epic’s tutorial series on creating a top-down shooter using C++. If you’re new to Unreal Engine, check out our 10-part beginner series. This series will take you through various systems such as Blueprints, Materials and Particle Systems. 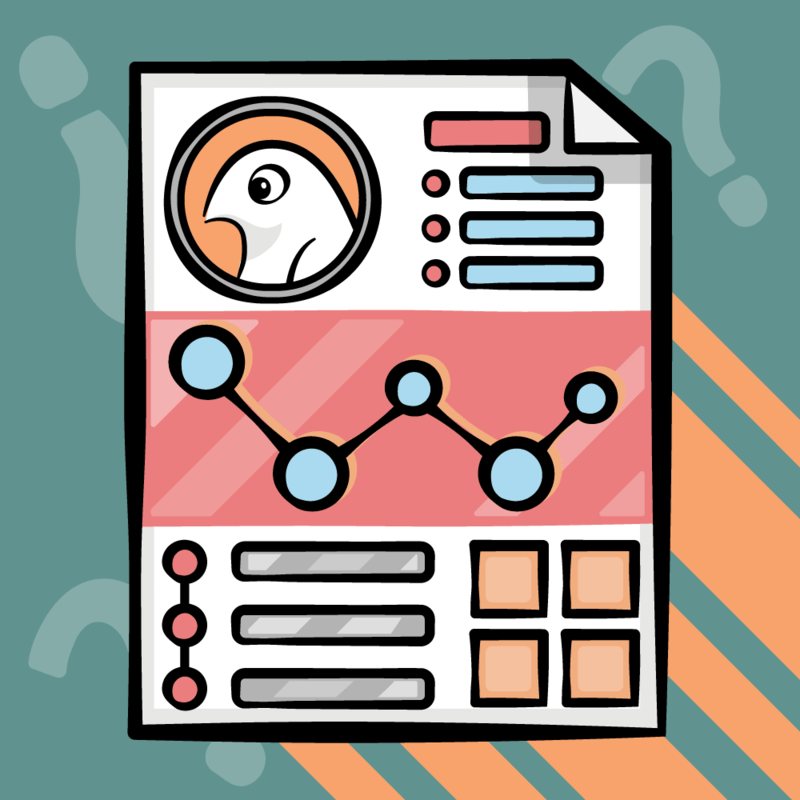 If there’s a topic you’d like me to cover, let me know in the comments below!